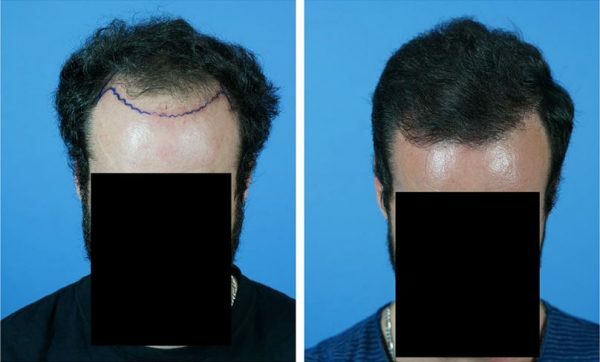 Before and After hair transplant with Dr. Gabel. We all know and accept that should our identity be stolen online that there are remedies and laws in place to protect us. But who do you appeal to when the identity thief is Mother Nature herself ? In the past not much could be done. Back in ancient Greece times pigeon droppings were used as a so-called remedy for balding. In 1800’s America cow manure was suggested. Even today a host of quack remedies are available for purchase including laser caps and combs. But none of these actually work. So, again, who does the young man who has lost his hairline and the 4 inches behind it appeal to for EFFECTIVE help ? One answer is Dr. Steve Gabel of Portland, Oregon. 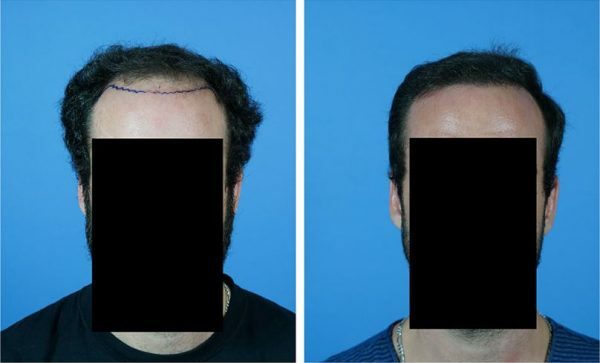 This surgical hair restoration specialist has treated thousands of patients with the best and most effective treatment for baldness known-hair transplants. Take this young patient of Dr. Steven Gabel. He started out with a healthy head of hair that contained nice thick waves of hair. But as he grew older he began to notice the hair thinning out, especially in the front. At first he could comb his hair into different styles and lengths to conceal the loss, but at a certain point none of his old tricks would work any longer. He had to do something so he sought out Dr. Gabel. After an analysis of the remaining hair and discussion of this man’s family history of hair loss, Dr. Gabel came up with a plan. He would treat the baldness, and he would do so in a SINGLE sitting. The plan including not only rebuilding his hairline, but replacing all the hair he had lost behind the hairline which extended about 4 inches back. The surgery took a few hours and at the end the patient looked like he had thousands of pimples in the area where we was bald. Hard to believe it would heal and turn into hair, but about 4 months later that’s exactly what happened. As the new hair began to grow the bald areas began to fill in. Almost as if he were in a Photoshop program and his hair was being digitally added. At first the hair came in very thin and sporatic, but as time went buy the hair got thicker and more uniform. Ultimately, his hairline returned and he had a thick puff of hair growing out of the once bald areas. So while nature did steal his identity, Dr. Gabel was able to give it back to him. The best part is that it is highly unlikely he will ever lose his new hair again because it was taken from the sides and back of his head where hair loss is generally very limited. 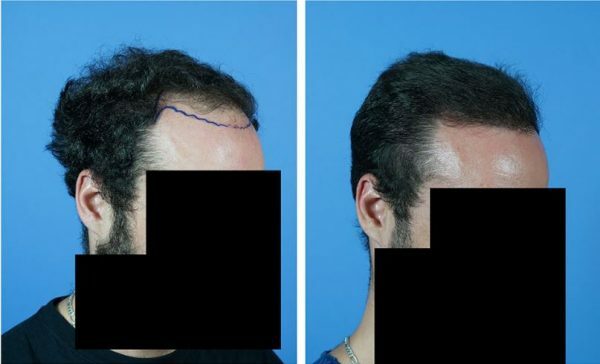 Dr. Gabel and his team should be given high praise for this transformation and all others he’s provided to hair loss sufferers over the years. Hair Transplant patient of Dr. Steven Gabel. Oregon.